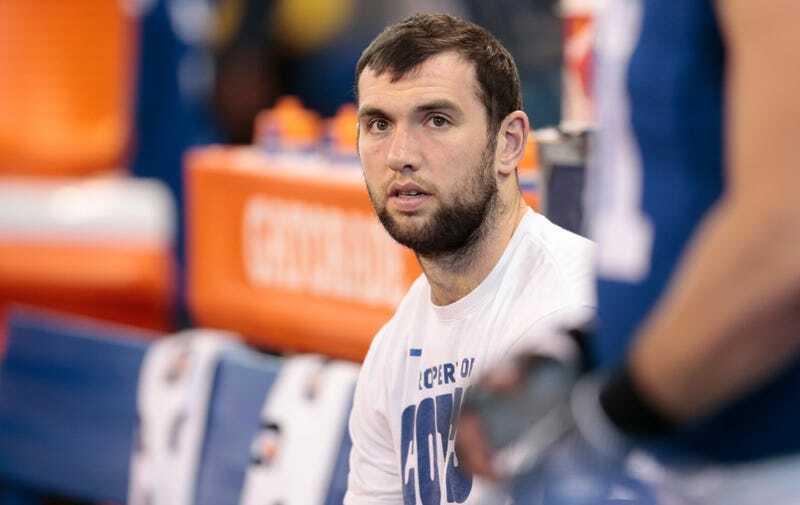 Andrew Luck has not played competitive football since 2016, because of an injury he suffered in 2015, thanks to numerous and nebulous setbacks and relapses. So, now that it’s 2018, how’s the onetime all-world QB doing? “Yeah, so I’m in the middle of sort of a little bit of throwing, but strengthening and preparing my shoulder to be able to handle the throw load that is part of being an NFL quarterback,” Luck said. Despite this being presented as encouraging, Luck’s status update, given during a Colts fan town hall meeting Tuesday night, is to me still pretty ominous. He’s “sort of” throwing. “A little bit.” Maybe someday soon the professional quarterback will be physically able to throw a football lots of times in a row, and without pain. Now Luck’s in California, working out not with the Colts but with QB gurus Tom House and Adam Dedeaux, trying to build back up his arm strength and endurance. It’s a program of repetition, and he sounds optimistic that he’ll be ready for OTAs, which begin in April, though doctors who have treated him warn that he’ll have to throw through pain this spring and summer, all just part of getting back to playing form. As with everything else in this saga, I’ll believe Andrew Luck is healthy when I see him play, and maybe not even then.